Perhaps this statement has to do with the fact that perhaps the construction of the third Temple would have started. That means that the false Prophet would already be known by then. 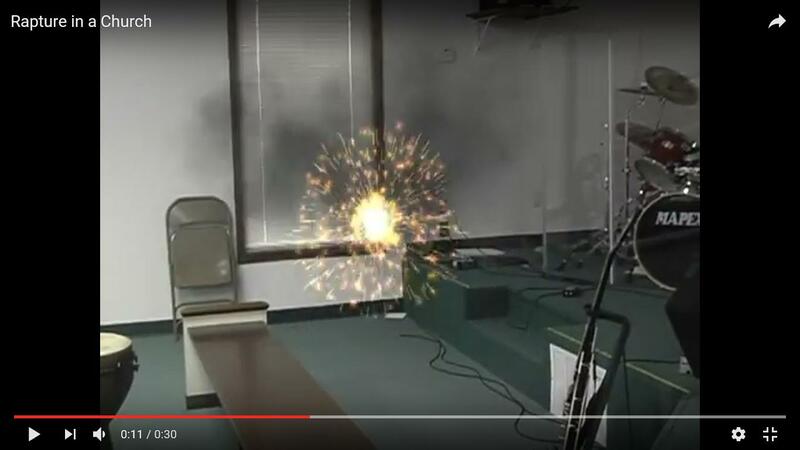 While the Christians follow the progress of the construction, the Lord suddenly comes with the Rapture! The third Temple is still under construction when Jesus comes to pick up His own. With this given, this Prophecy could be true, that the Lord will come sooner. Sooner than people expect. So how would you feel if Jesus would say this to you? What would you think? The Rapture in March 2018? That cannot be, because what about the third Temple and what is keeping the false Prophet from coming? 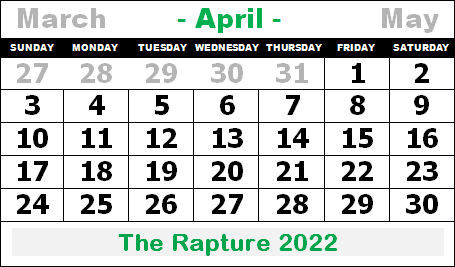 According to the vision of March 2018, the false Prophet would have had to reveal himself by October 23rd, 2017, but at least certainly in the last week of Oct. 2017, which did not happen. Do I want to know all this? Then there is only one possibility, fasting, total fasting! Brothers and sisters, I have unfortunately filled in wrongly the months of the vision of “March 2018”. On Tuesday, October 31st, 2017 in the afternoon at 2:25 PM, Jesus showed me how I should have completed the vision. This is the first time I have submitted this vision to the Lord with a fast. The vision is easy to fill in and even when I changed the months of April/May to Nov./Dec. I did not see that I would have made a mistake. The lines of this vision can not be changed. It is a definite fact. But because time is no longer in relation to the possible Rapture in March 2018, I went for a strict prayer. I was fasting for a day and a half when I studied the vision of March 2018 again in the afternoon. By seeing this vision, I began praying: “Lord Abba Father, what did I fill in wrongly?” And the moment I having said that, I suddenly saw that the months had to be filled in from March on and I did not see that before. It should have been: (March) April, May, June, July, “August 2018”! By fasting and because of my prayer, I assume that Jesus showed this to me. Is this vision now completed correctly or may there still be another variation? You will understand that I was extremely astonished when I saw this. How could I have been so mistaken? So it looks like I made mistake with the months of the March 2018 vision. I could not have suspected this. A generation: 70 years and 3 months? We usually hold on to a full time of an average of 50, 70 or 100 years. But 70 years and 3 months? Yes, that is possible too. This means, therefore, that a generation with God does not necessarily end by entering the 70th year, but it can also be 70 years and 3 months! (1948+70= 2018) From May 14th, 2018 to (23 – 31) Aug.2018 is 3 months. Why are the two bottom lines, from top right to bottom left, facing down? This concerns the two years of 2014 and 2015 and Nov./Dec. It is now understandable that I should have calculated the months starting from March. The months of Nov./Dec. must be April/May. The years 2014, 2015 and the months of April and May are downward and may indicate the passed time. May the month of May have something to do with May 14th, (1948)? If so, then the countdown of the last generation would have begun from there. The years 2014 and 2015 have nothing to do with it. 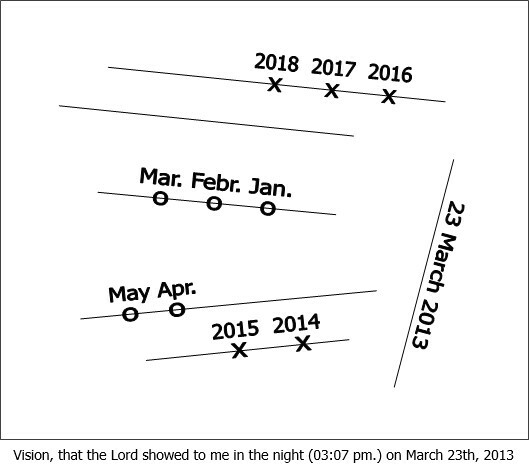 The other three lines, indicated from the bottom right to the top left, indicate a new time, in this case the End Time, which ends in August 2018. From the moment that I have been busy with the End Time, I already saw that a generation with God the Father is exactly 70 years. I did not doubt that and then I received this vision from Jesus on March 23rd, 2013 as a confirmation. But then I should have filled it in well and I did not. The mistake was concerning the months. Brothers and sisters, if you do not want to believe the months, look at the year! Brothers and sisters, I want to make you understand of how I saw and have drawn the “March 2018” vision and how it should have been completed. This is the vision I received from the Lord on March 23rd, 2013. 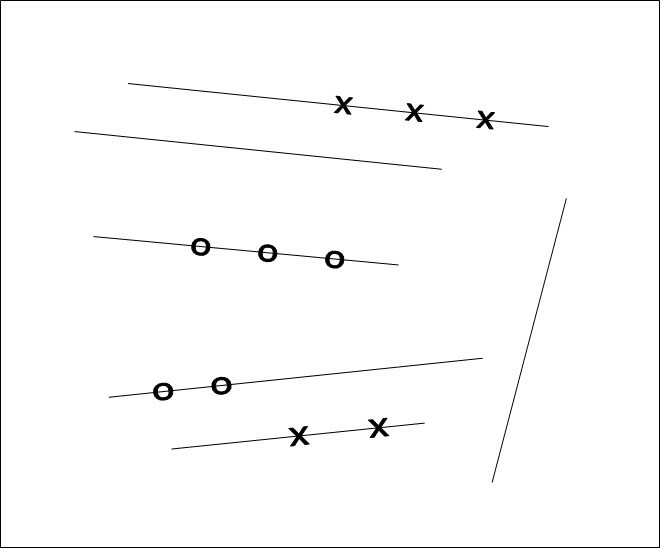 I saw in a square 6 lines, all of which are skewed, including crosses and spheres (circles). There were no months and years pointed out. This is how I started to build up the time in the vision. 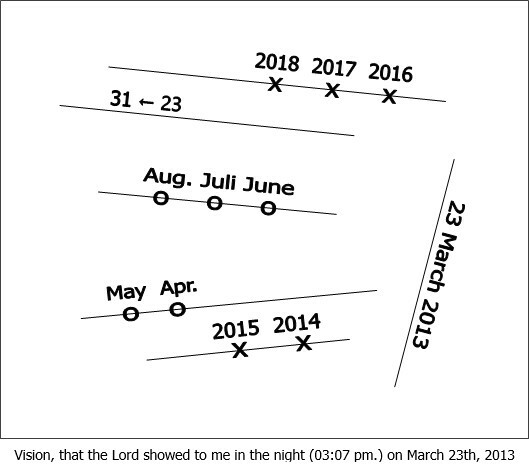 On the oblique line, almost vertically, from top right to bottom down left, I set the date when I received this vision. Afterwards I have put the years. By seeing this vision, I knew that the years should be filled from bottom to top and right to left. That is because of the layout of the lines. What I also saw was that the crosses represent the years and the spheres (circles) are the months. See the months of April and May. This is what I initially filled in. After March, April, May and so on. From March 23rd, 2013, I had filled in the date like this. This entire website I have build up with this date of “March 2018”. I could not complete the blank line, under the line of the three years, for long because I did not know what should be there. Only in Sept.2016 I saw that the last days had to be mentioned on it. Brothers and sisters, would you have known better with what I had filled in first? It just could not be seen. At least, I did not see it. The fact that I wrote Jan./Feb./March was because I thought that on this third line the first months of 2018 had to be mentioned. But it did not occur to me that I had to put the months starting from March. The month “march 2018” should have been “August 2018”! The time from March 2013 to August 2018 is not exactly five years, but is now 5 years and five months! The date of 23rd – 31st Aug. 2018 I hold as the week in which the Rapture could take place. 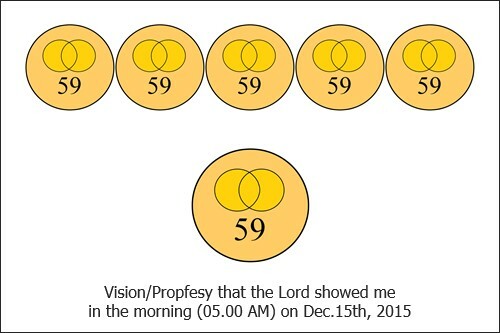 That is because I received the vision on the 23rd. Because the End Time, instead of March 2018, ends in August 2018, all times must also be adjusted. But what about the age of the false Prophet? On February 5th, 2018, he will become 56 years old! The false Prophet will be killed in August 2018. According to the Jewish era, the 1000-year Peace Kingdom begins in Sept.2022. But… I do not come beyond Sept.2021. The fiches indicate 59 and I think that it concerns the age of the Antichrist, because at that age he will be killed. That will happen in June 2021. The Antichrist by then would have ruled for over 2 years and 11 months. But that is actually not possible. 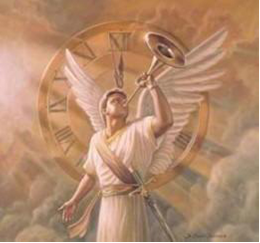 For, according to the vision of Isaiah, the spirit of the Antichrist shall rule 3 years, 8 months and 12 days! If that is indeed the case, then the false Prophet should reveal himself in Nov./Dec. 2017, otherwise this time will not be correct. The nr.59 is the age of the false Prophet/Antichrist. He will not become older than 59 years. The fiche with the two circles in it represent the false Prophet and the Antichrist in one body! 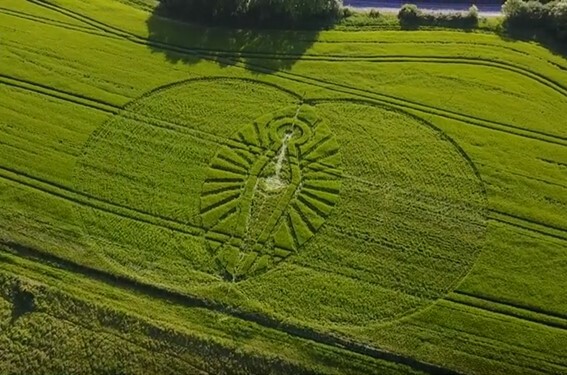 The mystery 22nd of May 2017 hidden in a crop circle! The Rabbins are sure that Nov./Dec.2017 is the year of the Messiah. But, according to my calculation, it should however be in March 2018, because after the revelation of the false Prophet every other 5 months another horse shall appear. If the false Prophet is killed in Aug. 2018, then the false Prophet has revealed himself already 5 months before. But that does not necessarily have to be in March 2018. The false Prophet could indeed manifest himself earlier. If not, then it is not quite unthinkable that the patience of the Rabbins will soon end. They could decide that the construction of the third Temple should already begin. If the rider (false Prophet) on the white horse indeed reveals himself in Nov./Dec. 2017, he will then govern until Aug. 2018. After that, following the red horse, the black horse and then the pale horse will appear every five months. The three horses of Armageddon. The revelation of the false Prophet namely is the signal for the construction of the third Temple. Taken from Nov./dec. 2017, the third Temple could be build in ±9 months. But then the work has to continue day and night. The years are well indicated. But the month of March should have been August 2018. After this discovery, I immediately informed other Christians and explained the situation. 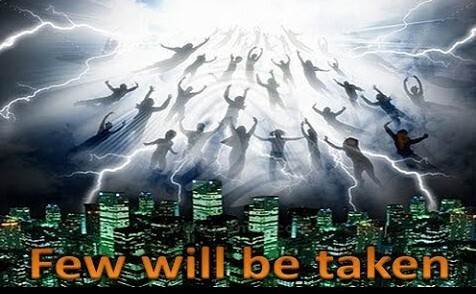 In my opinion, this vision continues to be about the Rapture. If the completion of these months is still not correct, then the vision of “August 2018” might have to suggest something else. But who among you, among the Christians of God, thinks that this vision has nothing to do with the Rapture and… do you also believe that? 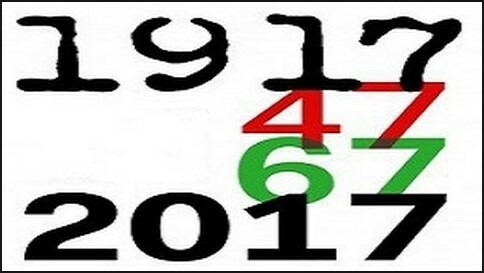 But what many do not realize is that this generation starts from the 14th of May 1948 to 2018 to enter the 70th year, which will officially end on May 13th, 2019, because after this date we are in the 71st year. After the birth of the State of Israel, this generation must therefore be seen as the 70th year in which the Rapture will take place. From May 14th, 1948 until Aug. 2018, it is 70 years and 3 months. With this vision, the Lord not only has given me the year but also the month of the Rapture. But we can not determine day nor hour. That is impossible! The Lord only mentions the day and the hour, not month nor year. Otherwise, I would not have received the vision about “August 2018”. The white horse of Peace and the three horses of Armageddon. Jesus, like the Lion of God. The King is Coming! TIME IS RUNNING OUT FAST !!! We have very little time left! Brothers and sisters, let the people not be overwhelmed by Armageddon. 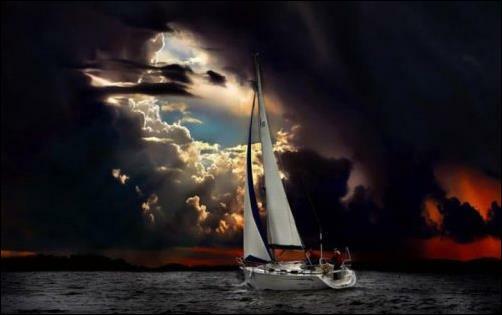 Jesus, comes soon on the clouds! It is just the other way around! Many (±97%) will be taken up? It is just the other way around! This is the reason why the Lord says that of the 1000 less than 1% of the Preachers, Pastors, Leaders and Evangelists and worldwide only 3% of the Christians will be taken and shall hear the trumpet. The Leaders are responsible and they have failed! 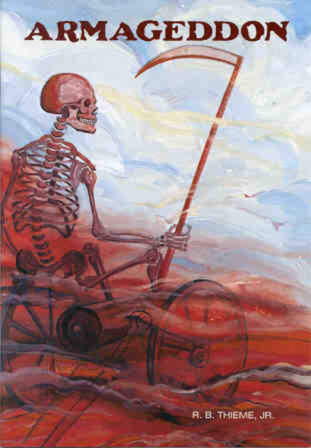 They have not preached about the End Times and what the consequences of Armageddon will bring. Only 1 stays behind? It is just the other way around! 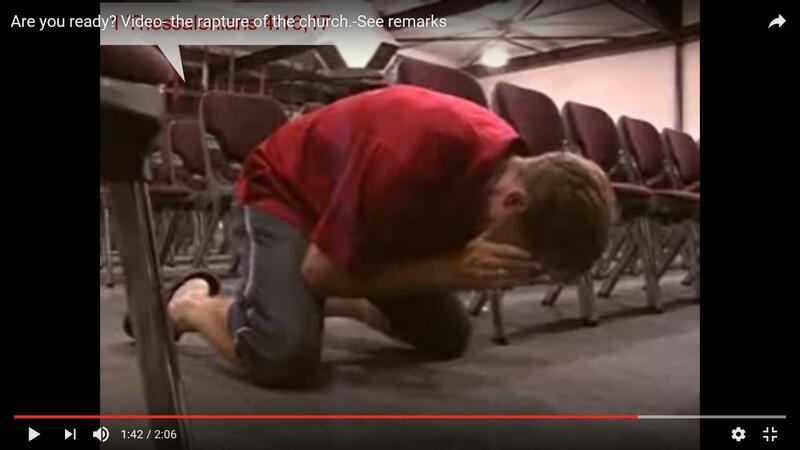 Of all the Rapture videos, this one has moved me the most! In this video, a father is swinging his child and suddenly the little one has disappeared! But above all see the moment when the man only has the wedding ring of his wife left to remember! This church is really crowded and then the Rapture is there. 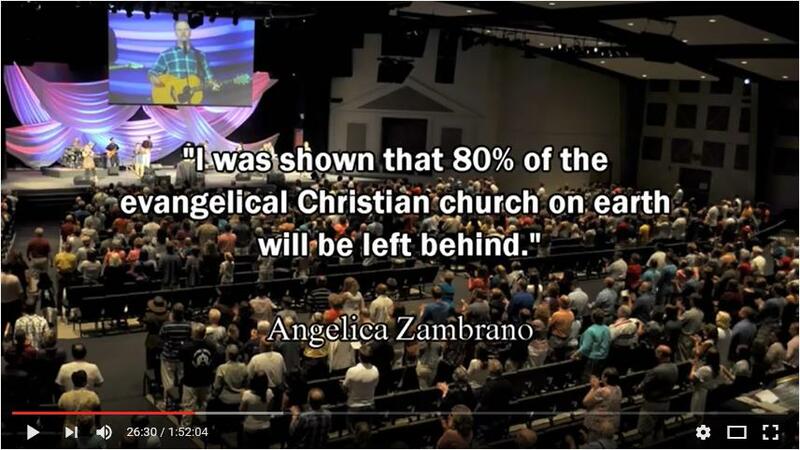 And only ±15 Christians are left behind? It is just the other way around! You must be ready. But, to what extent can they prove from themselves that they will join the Rapture? There are only a few! But especially see at – (1:48)! There will be settled with the Leaders! 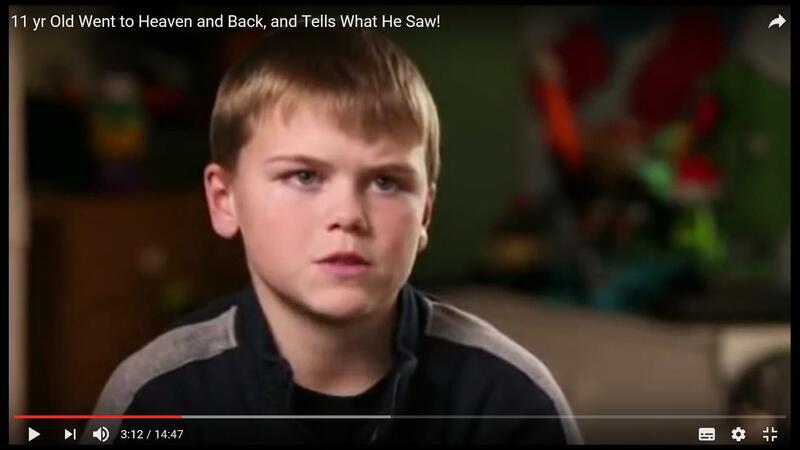 11 yr. Old Went to Heaven and Back, and Tells What He Saw! 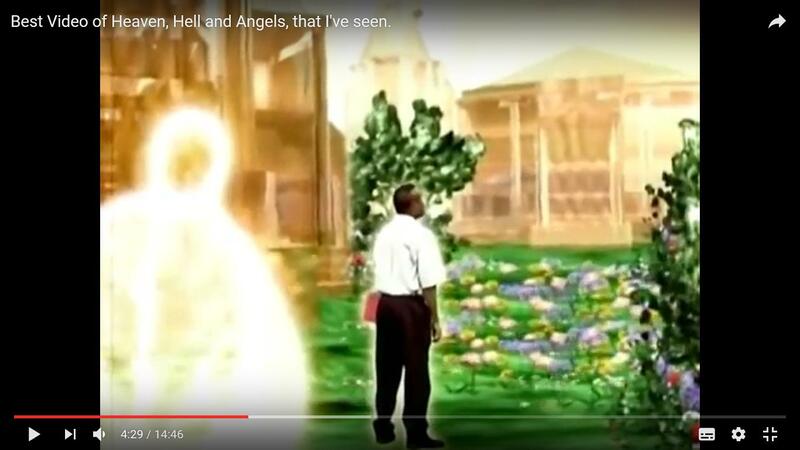 Best Video of Heaven, Hell and Angels, that I’ve seen. He saw the heavens and also saw hell. But if the book were to be closed then he would actually go to hell. He would also stay behind with the Rapture. Until God called him! And God the Father gives him a commission. (Video) This Turkish man (Ali) was addicted to the alcohol when he saw Jesus in a dream and his life was changed forever. Desperately, he went to Saudi Arabia where alcohol was forbidden. When he arrived there, however, it appeared that alcohol had become available. He then went on pilgrimage to Mecca, hoping to be freed from his alcohol addiction and to be led on the path to become a true Muslim. 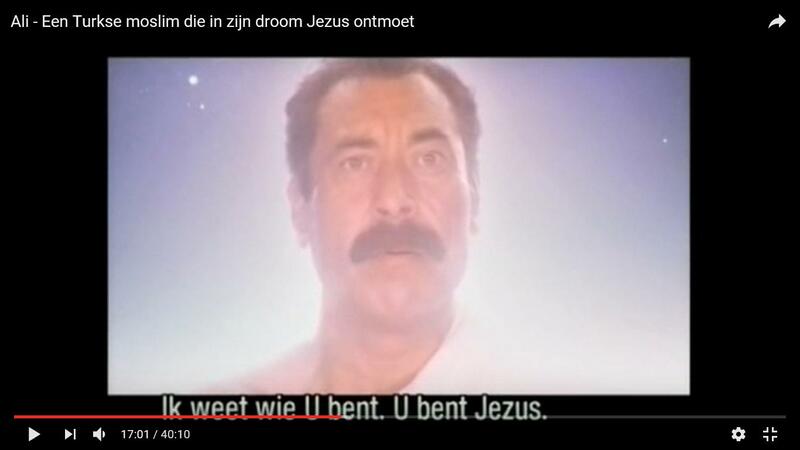 To his surprise, he met Jesus Christ instead, the Man in white. Hezbollah warrior converts and becomes a Christian. 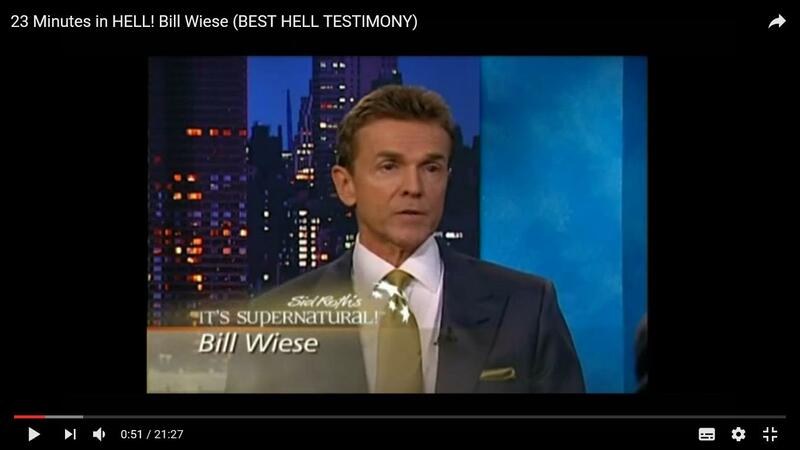 See and hear his testimony! A Hezbollah fighter (Afshin Javid) ends up in prison. He reads the Koran and suddenly he is overcome by an evil spirit. 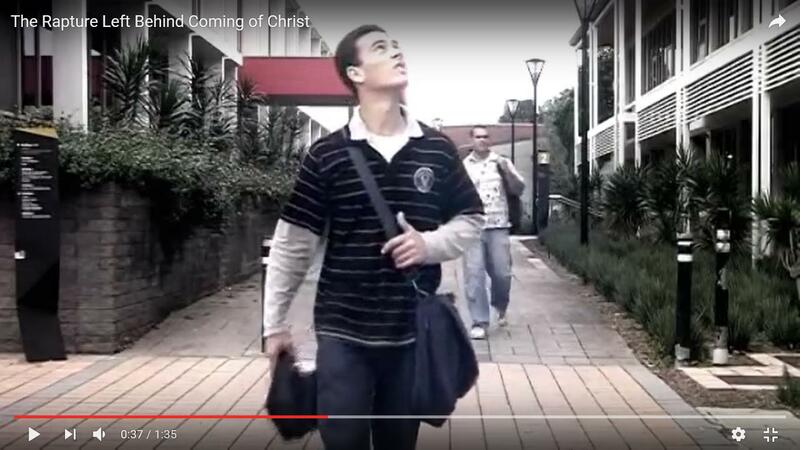 He calls Heaven for help and suddenly hears a voice that he should call Jesus. He does that and is liberated, but then the doubt begins. After two weeks of fasting and praying, he receives no response from Allah; and then Jesus Christ appears in his cell. Brothers and sisters, Christians come to me because they do not believe their own pastor anymore! 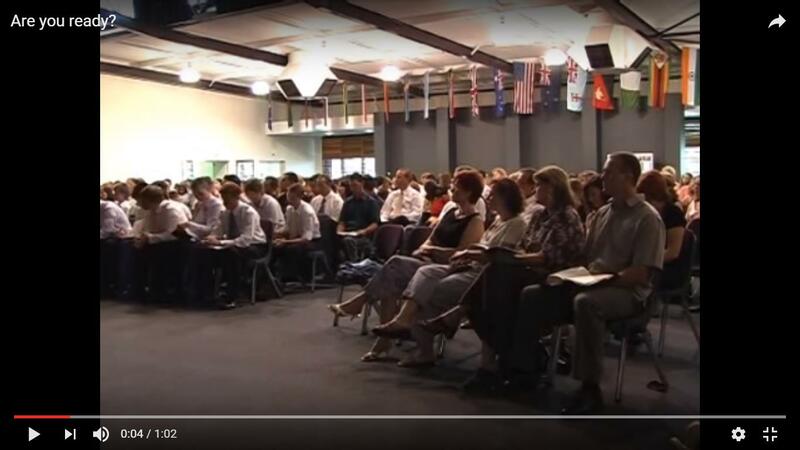 He tells them over and over again that the whole congregation (100%) will be raptured while the Christians, the little ones, do not believe it anymore. These little ones have read the report “But in vain they Worship me” and have been completely shocked and have become aware that they may stay behind. Because out of the current Church of Laodicea only 3% is included! Immediately, I tell them how important it is to collect knowledge. Make sure you belong to the wise virgins, as they have the knowledge in the 2nd and 3rd grade! In each congregation, ±40% are mentally absent and others, ±30% of the members are mentally dead. Total 70%. The Pastor can only do his very best for the remaining 30%. It so becomes clear that only a few Christians of this group shall be included. When I told this to a Pastor, he had to admit that half of his church is asleep and many others are not or hardly interested, and also many others who are Apping with their phone. Many come for the cosines. Throughout the week, during Bible study, only a few are present. Before the Great Revival shall burst out, the Church of Laodicea has practically fallen asleep. It has become a sleeping congregation. <= See Countdown! The End Time is almost over. The average of all churches and congregations together is now about 3% that will be included with the Rapture and with the Great Revival another 17% shall be added. But when the Great Revival begins, that number shall be much more. 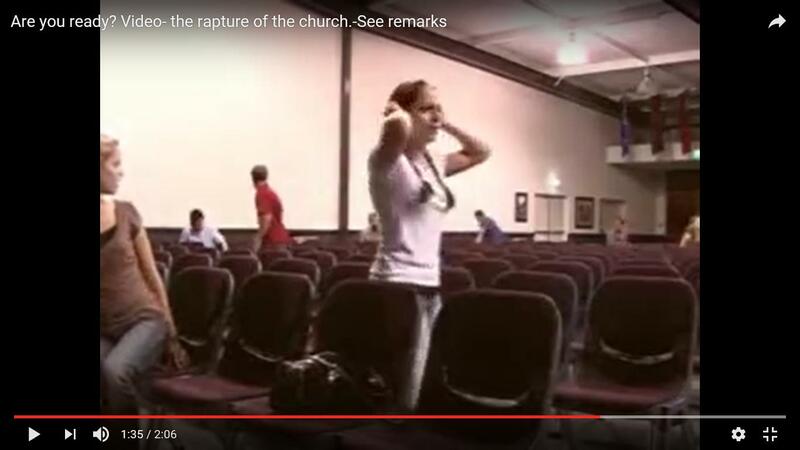 Just before the Rapture, almost all the congregations shall be fully crowded! The Church of Laodicea represents in the End time about one billion Christians. 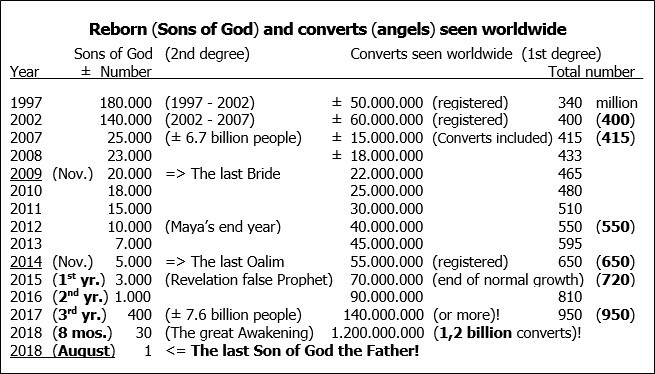 With the Great Revival and another one billion +200 million extra, a total of 2.2 billion Christians. About the 200 million I did not know of. Jesus, gave me this on 20-06-2017. The Lord has given me the message that this Great Revival will begin from march 2018 and will, within one week, pass throughout the whole world, coming from America. 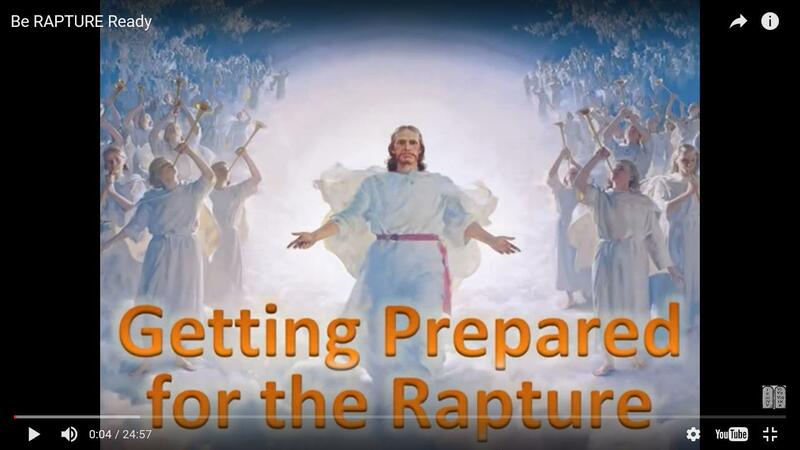 If the Rapture then will take place in August 2018, thus within five months, everybody shall have heard of Jesus. But with faith alone, you have not yet passed Satan, because Satan also believes. Know then what a great knowledge the wise virgins possess, surely! Many Christians do not have the right knowledge. Anyone who lives and acts in the 1st degree of his tolerance does not belong to the foolish virgins. Their level is even lower. No knowledge at all is found in the 2nd and 3rd grade. Brothers and sisters, I have had many dreams, many visions. And what I saw is something you do not want or like to hear. Especially many Pastors prefer to know nothing about it. I saw that there were literally few that were raptured. And suddenly there was the Rapture. Then everything happened as in a flash. I saw hail of fire raining down on the Earth and there was a great earthquake. An earthquake that the world has never seen before, it was really horrifying. And many remained behind, those who in the world were the elite among the Christians. See, a statement from the Lord when it comes to the Rapture. Of the many Christians who have followed the baptism under water as the first obedience to God, only a handful of them will be taken. The Lord clearly addresses the present Church of Laodicea, as it is today. For after all, with the Great Revival, the angels of the Lord bring in a large crowd of 1.2 billion Christians from which the Holy Spirit can only take 170 million. Jesus: “Time has already elapsed. Time is up! I was stunned! The Lord gave me the number, how is it possible. With just over one billion, I assume that it will be about 1.020 billion people. I have tried to adjust my former calculation of 920 million. But I cannot, because I would not know where to start. Where do those other 100 million people come from? I think this should be calculated proportionately. About four months after I had placed the report “But in vain they Worship Me” on the website, Jesus gave me this number on Sunday (11-06-2017) exactly at 23:00 hour. Brothers and sisters, do you have any idea who all of these are? 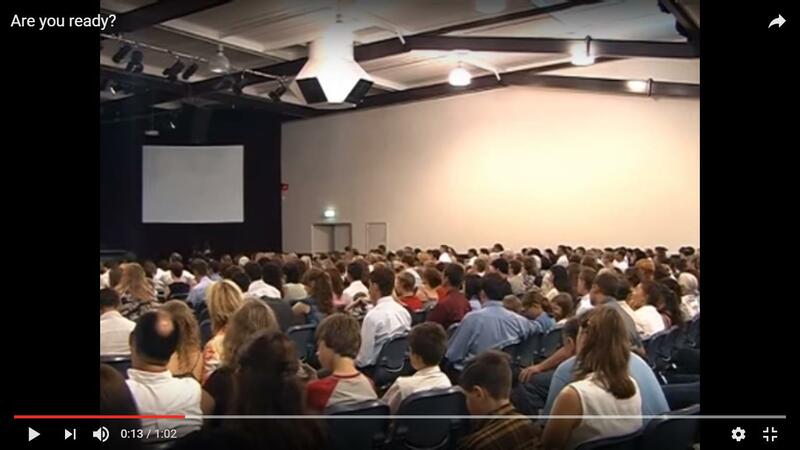 170 million new wedding guests, 600 million children from 0 to 7 years old (these are all children of innocence) 20 million children from 7 to 12 years old (these children are sanctified by their faithful parents) and worldwide another 100 miljoen severely disabled and children with down syndrome of all ages. Jesus, gave me this amount of 100 million. (30+170+600+20+100)= Total 920 million who shall participate in the Rapture. But… that will now become just over one billion. Of the 1,020 billion people who will now be included in the Rapture, I was very close with my calculation of 920 million. For the Lord takes up a little more than one billion people. With people are understood, big and small, and even what is in development in the mother’s belly! In exactly the same way, the Lord gave me the year and even the month of the last Bride and the last Oalim with which the End time has almost ended. 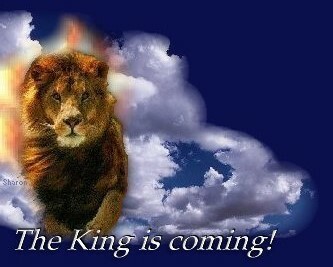 The Lord has given me not only the year, but also the month with the End-time vision of the Rapture! Just like that of the Bride and the Oalim. That is very special. Look now at the year 2009! The last Bride. Initially, I thought that the last Bride had been closed in 2012, because that is what I mentioned. But the Lord made me know that this was already in November 2009. Surprisingly, the Lord also gave me the month of that year… november(!) 2009. And what do you think of the last Oalim. That year 2014 I wrote correctly. But then again the Lord gave me the month… november(!) 2014. The month I did not know. The year alone would already have been good. From November 2009 until Nov.2014 is exactly 5 years and from Nov.2014 until March 2018 is exactly 3 years and 5 months. It will take another 5 months before the Rapture will take place in August 2018. Again, it is clear that time is running out. Of the 7.6 billion people, who will be in March 2018, one billion people will be taken. Of the remaining 6.6 billion, Satan shall kill in a time frame of only 48 hours(!) one billion of the world’s population. All these people will be killed in their sleep. 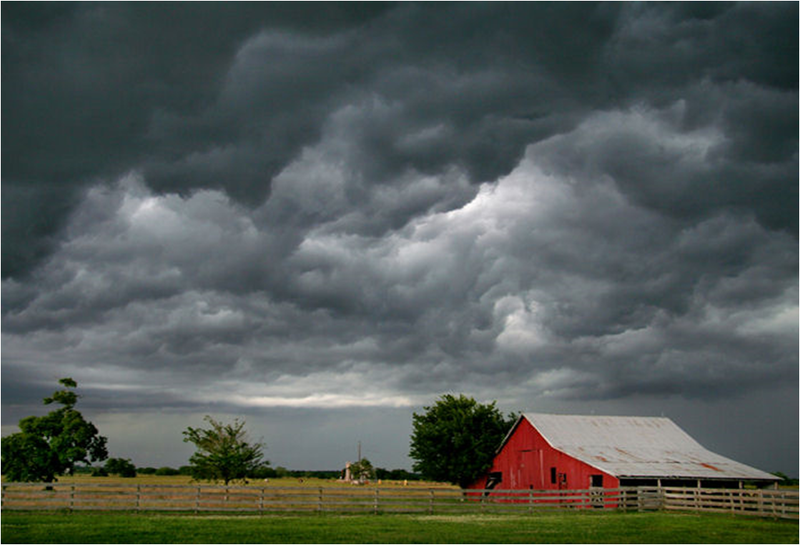 This happens immediately after the Rapture! I saw this image in Aug.1990. Jesus has taken His own and Satan, what is his. Remains 5.6 billion. One can hardly imagine this. 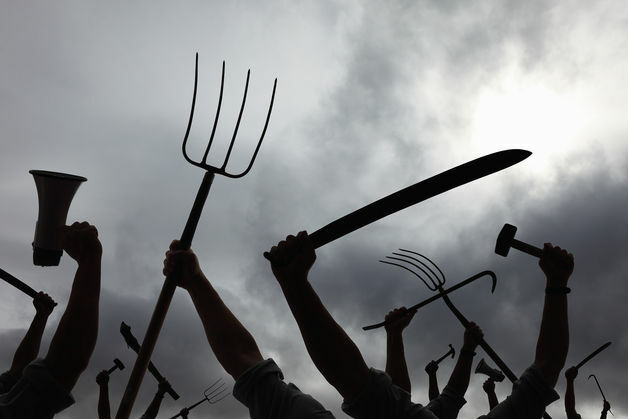 Within a few years, another ¼ part (1.4 billion) people will be eradicated (Rev.6:8). This as a result of wars, epidemics and the collapse of society. Remains 4.2 billion. All these things will be a natural reaction to the war in the Middle East. The world is filled with horror! Of the remaining 4.2 billion, eventually, between 40 and 50 million will survive Armageddon. All of these lucky ones do somehow not have the Burnmark Sign/Logo (666). Satan has not been able to get hold of this small group.